The first in a series of short publications accompanying the exhibition series OBJECT LESSONS. OBJECT LESSONS is an exhibition in three parts, unfolding over three consecutive exhibition periods in the Lady Sheila Cruthers Gallery. Each discrete ‘chapter’ presents contemporary art from the Cruthers Collection of Women's Art in which the fundamental properties of the art object and experience are used to address enduring questions of representation, perception and the role art in society. In addition to works from the CCWA, each chapter in the OBJECT LESSONS series will feature a specially commissioned, site specific work from a Western Australian artist. Traditions of art-making and art history are variously unpacked, subverted, lampooned or celebrated, getting down to the nuts and bolts of how we look at and think about art. Curated by Gemma Weston, OBJECT LESSONS features work from: Alkawari Dawson, Julie Dowling, Mikala Dwyer, Agatha Gothe-Snape, Elizabeth Gower, Anna Kristensen, Elizabeth Newman, Raquel Ormella, June Walkutjukurr Richards and more. Paintings and things that aren’t paintings muse on the various contexts and meanings of the medium. 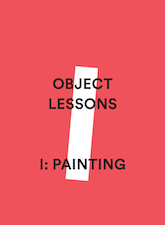 OBJECT LESSONS I: Painting brings together works that muse on painting as a noun and a verb, considering its heavy history, its continued re-invention and its shifting forms and meanings. Paintings made from ochre from the far North West of Australia meet paintings made using nail polish from the East Coast meet animated PowerPoints that reference well-known painters like Robert Motherwell and Sidney Nolan in pixels. Rather than seeking to define what is or isn’t a painting, the exhibition offers a buffet of different approaches to and perspectives on painting and painters that shed light on the medium’s enduring significance and popularity. Artists: Goody Barrett, Angela Brennan, Alkawari Dawson, Mikala Dwyer, Agatha Gothe-Snape, Liang Luscombe, Shannon Lyons, Queenie McKenzie, Elizabeth Newman, June Walkutjukurr Richards and Miriam Stannage. Paintings, prints and curtain-like objects make trouble with image/object/gallery relationships. Pattern, series and the multiple take on art-historical systems of value and representation. Featured work: Elizabeth Gower, Choices (detail), 1986, acrylic on paper, 53 x 42cm, CCWA 868 © courtesy the artist.